Since launching hockey in 1997 to subsidize its non-revenue generating sports UNO’s netted a nice return on investment. Maverick hockey crowds rank among the best nationally, with annual ticket revenues of $2 million. When the school dropped football and wrestling in 2011, it added pressure on hockey to be the signature sport. The University of Nebraska at Omaha has enriched the city’s hockey legacy. The minor league professional Omaha Knights (1939 to 1975) began the love affair. The amateur Omaha Lancers (1986 through today) continued it. UNO found its niche as Neb.’s only collegiate hockey team. Despite gritty performances and many upsets its first 18 seasons. UNO didn’t emerge as a title threat. Until perhaps now. Coach Dean Blais, tasked with making Mav hockey nationally relevant when hired in 2009, has guided UNO through conference changes, player suspensions, stars leaving for the NHL and solid if not stellar play. Now, for the first time this late in the season, he has UNO contending. His team’s defeated several highly ranked clubs, splitting four games, three in overtime, with perennial power North Dakota, where Blais won two national titles. His best offensive player, sophomore forward All-America candidate Austin Ortega, recently tied the NCAA single-season record with his nation-leading 10th game-winning goal. UNO, 17-10-3 at press time, climbed to No. 4 in the Division I ratings. It’s led the powerful National Collegiate Hockey Conference most of the year. Entering the final regular season home series versus Colorado College at CenturyLink Center, UNO hopes for momentum that carries into the NCHC Frozen Faceoff and the NCAA tournament. 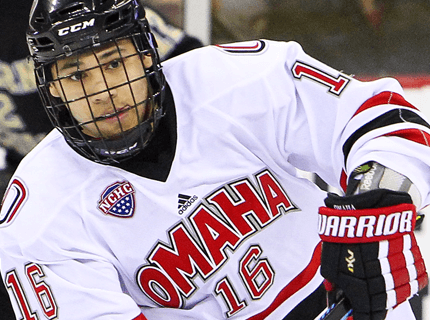 As UNO hockey enters the local sports conversation reserved for Husker football and Bluejay basketball, it may establish itself as a must-see attraction and traditional power. The timing’s apt since it gets its own facility next year when the UNO sports arena opens on the Ak-Sar-Ben campus, where the Knights played. Touted underclassmen helping drive this special season were recruited to the new venue. He says preseason predictions of UNO finishing sixth in the league provided motivation. He credits an early road trip to Western Michigan, where UNO got a sweep. as a confidence-booster and bonding experience. The right mix of leadership has team chemistry just right. Blais doesn’t know if UNO’s truly arrived but he’s confident it soon will. “I would think so but you never know from year to year. This is a special group of guys and for them I hope we win a league championship, get to the Target Center (home to the Frozen Faceoff), advance to the national tournament. Those are benchmarks for a program and our seniors know they’re paving the way for the underclassmen. Hopefully getting to the tournament isn’t a big accomplishment, it’s an expected accomplishment every year. UNO athletic director Trev Alberts says the arena signifies that Mav hockey matters. He says the arena will put the program on near equal footing with its stiffest competitors. “When I hired Dean I really wanted to have somebody who’d been there, done that, who knew what it took to win at the highest levels. Having its own intimate space will benefit UNO, which shares the huge CenturyLink with Creighton. The average hockey crowd of 8,000 downtown still leaves the venue half-empty. That same crowd fills the new arena. It should spike demand from fans and corporate sponsors. “Clearly this will be the best opportunity we’ve ever had to have a branded-out facility of excellence our student athletes can compete in,” says Alberts. That loyal base bodes good times ahead. Blais is trying to ensure his team attends to all the details heading into the intense post-season, where little things become magnified and championship teams find ways to win. Getting swept on the road at St. Cloud State (Feb. 20-21) resembled the late season swoons UNO’s suffered in past years. Even if UNO should reach the top, he says, “it’s one thing to get there, it’s another thing to stay there.” First things, first. Zombo can’t imagine what a UNO hockey title would mean. UNO’s dream ride continues at home Friday, March 6 and Saturday, March 7. Listen on 1180 The Zone 2. Omaha history salvager Frank HorejsiPlease Sir, May I Have My Job?